Maybe you do not understand this Spanish word but at least one person who will is the Rt.Hon.Deputy Prime Minister, Nick Glegg. This generally is used to refer to the actions taken, or to be taken, to fix a problem which is not a good solid everlasting solution but more of a "quick fix", a"half way house", a "temporary solution(which turns out to be permanent, or semi-permanent)". One thing that is implicit is that it is derogatory without doubt. No other word can express with such disdain work which is carried out in ways which are shoddy, badly thought out, and badly executed. The infrastructures committed by the British governments over the last fifty years can, in many cases, be called "chapuzas". More specifically, those transport connections in and into Heathrow airport in search of solutions to problems have not solved the problems only in part but also badly. The ideas presently being floated for more solutions at Heathrow are being looked at piecemeal with the high likelihood of them being patches which do not give us good long lasting solutions. In other words we are being offered "chapuzas" yet again by these civil servants and politicians (these "chapuzeros"). Let us firstly look at the development of Heathrow. This was the layout of the airport when it was taken over from the RAF in 1946. The three runway triangular plan was typical of RAF aerodromes of the time. The report by the London Airport Advisory Layout Panel for development at Heathrow was presented in January 1947. As can be seen from the diagram up to 10 runways were envisaged using not only the existing area of the aerodrome but also an extended area to the north of the Bath Road (A4) which was to be diverted as shown. This configuration provided three sets of parallel runways so minimise the effects of crosswinds. After the extensions south of the A4 to be completed by 1949, the third stage north of the A4 was to be completed by 1953. The reason this stage was placed last was that it meant the knocking down of the village of Sipson. This was considered inappropriate in the immediate post war years due to the severe shortage of housing. Need it be said that Sipson is still there. This was an opportunity lost since the development round the airport in 1953 was much less than at present. That third parallel east-west runway (Nº 8) would have approximately occupied the site of the 21st century proposed third Heathrow runway thus providing the airport(in 1953) with the expansion and flexibility it seeks now sixty years later. As a result of complying with that proposal other infrastructure planning would certainly have taken a different course. That blundering failure is an illustration of short-termism and political expediency - no vision.The idea was finally abandoned in December 1952. As George Hayter says in his book, "...the recommendations of the Layout Panel contained few ideas which had not been well aired. Nevertheless, the Panel chose the most bold and exciting of all the possibilities." Suffice it to say that, apart from the above mentioned, they envisaged the central area, where the terminal(s) were to be situated, to be reached by a four lane tunnel under the north runway. This was built in 1950-53 and considered revolutionary at the time. This was the layout of the airport when it came into use in April 1955. It was later opened officially by the Queen on 16th December 1955. Take note of the extended maintenance area to the east. This is where BA maintenance facilities are now situated. The Pan Am maintenance facilities are now occupied by Terminal 4. Also the development along the A4, just north of runway 1, is very marked in the nine years from 1946. In the central area was the Europa building which handled domestic, European and North African flights.The overseas terminal was still on the A4 and not in the Central Area. Long-haul flights had to wait until November 1961(BOAC) and March 1962(other carriers) to move to the Oceanic building in the central area. By the mid sixties traffic had grown so that a new terminal was deemed necessary. This was opened in 1968 for all British, Irish and Channel Isles flights of BEA and Aer Lingus. The Official opening by the Queen was in April 1969 and it was named Terminal 1. She also renamed the Europa Terminal 2 and the Oceanic Terminal 3. Heathrow at this stage was handling 14 million passengers annually. It was at this time that better transport links to central London were considered essential. "Since the 1940s, British Rail have had plans to link Heathrow to their national network. The favoured scheme always used to be one connecting the airport to the Feltham line, which passes to the south of the airport and runs into the central London termini of Waterloo and Victoria." It just goes to show that the planners then did not have the materials (post-war rationing) nor the money (bankruptcy of the country because of the war) but they certainly had vision. The idea of a rail link into Heathrow came up again at the end of the 1960s. The idea mooted was a connection from Feltham Station direct to the central area, as illustrated. (i) Lack of train paths: From Feltham station trains could go through either Twickenham or through Hounslow to where the tracks met at Barnes then to Clapham Junction and on to Waterloo or Victoria. The Victoria solution was preferred but rejected as it implied major crossover works at Clapham Junction so Waterloo was accepted as the terminus. However, these trains ran along the Windsor and Reading lines which had heavy traffic and lack of platform availability in Waterloo. Also the service level would have to be reduced during the morning and evening rush periods into/out of Waterloo. This would occur just when the same rush periods demanded nor less but more service to/from Heathrow. (ii)Level crossings:Including one at Feltham itself, there were six level crossings along the Twickenham route while five along the Hounslow route. This would have meant closing the level crossings to road traffic for longer periods still, increasing road congestion. The cost of building the necessary bridges or tunnels for the road traffic was seen as excessive and unacceptable. Thus an opportunity was lost to solve a problem which exists even today and will have to be confronted at some time in the future. These two reasons were paramount in causing the cancellation of the Airtrack project in 2011. Thus the door was opened for London Transport to extend the Piccadilly line from Hounslow West to the central area. The Heathrow Central extension was finally opened 16th December 1977. That year 24 million passengers passed through the airport. The solution was considered acceptable at the time but all the interested bodies realised that other solutions had to be looked at. By the early 1980s passenger figures passed 30 million so a new terminal was built at the south east of the airport. This was opened officially 1st April 1986 by the Prince and Princess of Wales but came into operation, in fact, 12th April. The single line loop from Hatton Cross to Terminal 4 round to Heathrow Central was opened with only one platform in T4 and is unidirectional. This so far has proved adequate but leaves the loop with no flexibility in case of accidents and breakdowns. The expansion to the south east of the airfield was BAA´s second choice.Firstly, they wanted to expand eastwards but this would have meant closing runway 2 which was "considered vital for crosswinds and emergencies." 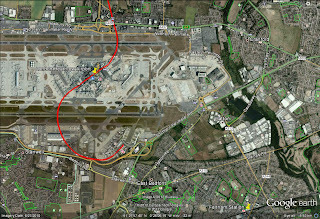 The rebuilding of Terminal 2 now taking place (spring 2012) is occupying that same runway 2 together with the satellite Terminal 2B. This means that another runway is being taken out with no backup replacement. "When London Transport extended the Piccadilly Line to serve Terminal 4, they built the loop line further west than it apparently needed to go. So far west, in fact, that it almost passes beneath the sewage works, making possible the later insertion of a tube station here to serve a fifth terminal." (i) London Transport did not talk to the right people to know their long-term intentions and so ended up with a shorter loop than was subsequently needed. 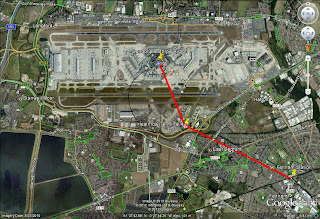 (ii) BAA apparently did not take into consideration London Transport´s loop so built the terminal station (and T5) further west than could have been done. (iii) No remedial construction work was considered feasible in place of a simple extension from Heathrow Central. The result means that London Transport ends up with an excess of unnecessary railtrack while T4 and T5 are unconnected directly - and such is the inconvenient situation today. Even with the Underground extension to T4 plans were afoot for a connection from T4 to the Great Western Main Line(GWML) approved in 1988. This non-stop rail service from Paddington mainline station to Heathrow T4 was opened in its full extension 23rd June 1998. The capital cost of GBP190 million was covered 80% by BAA and 20% by British Rail. Thus Heathrow Express(HE) is both operated by BAA and owned by them from the GWML to the airport. However, it is (now) maintained by Network Rail for BAA. As can be seen on the Google Earth map HE comes round in a sweeping curve from the central area to T4 ending up facing northeast. It does not give us the line of the track to T5, however. This makes one think that nobody has thought nor considered it worthwhile leaving the options open by any extension from T4 which might be useful or beneficial, such as an extension to Feltham. Now any such connection would need another sweeping "S" double curve to connect the service to the Windsor/Reading main line. Heathrow Connect (HC)(a joint venture between BAA and First Great Western) started 12th June 2005, running originally from Paddington to T4. This is a stopping service from Paddington along the GWML and then ran, originally, into Heathrow Central and T4. Now it runs only to Heathrow Central. From there anybody who wants to travel to (or from) T4 has to connect to an HE shuttle service. The problem seems to reside in the connection at Airport Junction between the HE line and the GWML. The frequency of trains is restricted which is why HE has 4 trains per hour(tph) running into T5 while HC only offers 2tph. The original connection at Airport Junction, Stockley Flyover, has a complicated system of operation.The original flyover connected the HE line to the fast lines on the GWML. With the introduction of HC services these used the GWML slow lines. This meant a combination of reverse running over the flyover and crossing the fast lines in the other direction(this is a total line capacity reducing measure). Yet another example of lack of forward planning (and/or cost cutting). It seems that this problem should be solved (at additional expense, of course) with the introduction of Crossrail services in 2019 which will take over the HC services. These will run from Heathrow, probably T4, to the central area, through to Paddington then central London and out east at 4tph(double the HC frequency). The Underground Piccadilly line services stop at T4 and wait up to 8 minutes before returning through the central area to central London. The frequency is approximately every ten minutes (i.e.6tph). A new terminal for its own use was pushed by BA. The site chosen was the sewage farm between the north and south runways to the west of the airport. From conception to opening 19 years were needed, including the longest public enquiry on record at 525 days. Construction began in September 2002 and that year 63.3 million passengers used the airport. T5 was opened by the Queen on 14th March but officially came into operation 27th March 2008. Over 67 million passengers went through the airport that year. On the opening of T5 the HE trains started running into that station. The original Piccadilly line loop round from T4 to the supposed T5 site and on to the central area was not sufficient, as has already been mentioned. As shown on the diagram the area was greater than that envisaged on the loop diagram.That meant that an extension of the original Underground connection from Hounslow West to Heathrow Central was now extended to T5. The service pattern set up was that some 6tph tube trains entered Heathrow at Hatton Cross and went south to rest at T4, then continued on the return journey through the central area back to central London. Another 6tph entered from Hatton Cross into the central area and on to T5. These then returned the way they had come. system as it is today. LUT´s Piccadilly line runs to T4 and T5. HE is shown as running to T5 and HC is shown, erroneously, as running to T4, in both cases from Paddington. It should be emphasised that from Heathrow Terminals 1,2,3 to T4 a free HE shuttle is now taken. The station in the central area has been known as Heathrow Terminals 1,2,3 since April 1986. However, it still retains that name despite Terminal 2 being knocked down in 2009. When T2 is reopened in 2014 T1 will be knocked down. Therefore, there is some confusion about what the name of the station will be. It is speculated that it will be renamed Heathrow Central. Probably, it is just as well that the name is not changed until the new T2 is reopened to avoid confusion. When T5 was constructed it was provided with platforms for the Piccadilly line trains, the HE trains and two more, unspecified use. For once somebody had thought ahead. An idea called Airtrack was promoted by BAA using these two platforms in the new T5 building. Three services were to be offered; Reading, Guildford and Waterloo. Each was to have a frequency of 2tph offpeak and 1tph peak periods. The problems involved have already been looked at in point 1 with the Feltham connection. Basically, these were (i) lack of train paths (thus the reduction in peak periods) and (ii) level crossings (extending the services to Reading and Guildford meant additional level crossing closures during the operation of the trains meaning additional traffic problems. BAA also wanted to extend some HE trains from T5 to Staines (solely to increase traffic on its services). This would have complicated things more with an extra turnback platform to be built at Staines. As it turned out, a combination of the difficult problems encountered together with the government´s drastic cut in investments and spending, convinced BAA to drop the scheme in April 2011. This blogger looked at the question 30th June 2010 in an article titled "Airtrack - is it worthwhile?" The Transport Secretary, Philip Hammond came up with this idea in September 2011. It was floated as a shuttle between T5 and Reading to connect to the GWML and services to South Wales, Bristol and the west country. After the initial news nothing else has been heard. This blogger looked at the proposal under the title "Reading - Heathrow Rail Connection" 6th October 2011, fairly soon after it came out. Without repeating the arguments extensively, the idea of connecting the two free platforms at T5 with the GWML is a good one. However, if it stops at that then it is short thinking. The bigger picture should be looked at in which the Reading - T5 connection is only a part. If that is not done then we would fall into the trap, yet again, of thinking small and developing projects which are costly to rectify in the long run. This particular project should be looked at with and linked to the Heathrow-Gatwick proposal. This is a proposal to link(with the horrible name of "Heathwick") the two airports so that the two Gatwick terminals would function as extra terminals for Heathrow. Obviously, this had not been thought through. The idea of linking the two airports is welcome but not in the terms as mentioned. The broader picture has to be looked at again which this blogger did on 11th October 2011, "Heathrow - Gatwick Rail Link". Here the proponents of the connection are thinking of, yet again, using the two free platforms at T5 to provide this link. Maybe at present they have the capacity to satisfy both(8 & 9) connections but if the services are successful then they will be proven lacking. That would mean, yet again, having to rectify short-term thinking with new constructions. The two projects joined together (Reading - LHR and LHR - Gatwick) offer greater possibilities. If then the line were extended to Ashford(Kent) we then have a connection to the Chunnel. That then would open up the possibilities of connections to Europe(Paris, Brussels, Amsterdam, Cologne and even Frankfurt). All this would provide traffic from the two airports (at least, and maybe even Luton), and from Reading (and all points north, west and south west from there). Direct trains are a possibility to mainland Europe bypassing the bottleneck that is London. It would mean that no spur from HS2 is necessary, alleviating the traffic through the capital. The possibilities of direct trains to mainland Europe from Wales, the South West and Birmingham are opened up while greater and better regional services are also a possibility. These ideas have to thought through on a broader scale, and then planned and executed carefully. On 16th may 2008 the infrastructure engineering group ARUP presented a plan to improve rail services between Heathrow and the rest of the country. It is also mentioned in a Wikipedia article, Heathrow Hub railway station. This was to be situated north of the airport on the GWML connected by a shuttle service to T5. Here again they were thinking of using the free platforms at T5. However, this idea of a 12 platform station fell flat on its face because it yet again introduced a time wasting change for connections to the GWML and HS2. Duplicity of effort, waste of resources, eating up of the Green Belt; there were many reasons to criticise this project. However, again the germ of the idea was not bad - if done at Heathrow. The basic objections were that it used the supposedly free platforms at T5, it did not take into consideration any other project proposed, and it was imprisoned in the concepts already put forward by the same engineering group to solve problems (HS2 etc.). Maybe the present infrastructure in Heathrow is non-adaptable to greater ideas or concepts. That is a question of looking at the present infrastructure with the plans to see if it can be adapted; also the traffic predictions have to be realistic and reflect the experience gained over the last fifty years. then we can consider if the present infrastructure can be adapted and used or if a new "heavy" rail station should be built to connect Heathrow to Gatwick and mainline Europe, and other parts of the country as well. This we will look at in the next blog. What has to be looked at, firstly, is what the country wants to do with Heathrow. If it is closed then what substitutes it? Thus a strategic plan for aviation would have to be drawn up and implemented quickly. If the decision is taken to keep Heathrow for, at least, the next forty to fifty years then total plans have to be laid down and implemented as soon as possible. Then the mistakes of the past have to be taken into consideration, learned from, and avoided. Complete solutions to plans for national, regional and local transport needs have to be tackled. This would mean that Heathrow, or any other airport for that matter, would not be looked at in isolation but as part of a whole. If plans prove to be reasonable and feasible then let them go ahead and not fall victim to narrowly interested parties or Treasury diktats. The greater good for the long-term should be paramount. That is the only way to avoid the mistakes of the past. Note: Passenger figures reached a high of 68,068,304 in 2007. In the period 2008-2010 figures fell in the economic downturn. Now in 2011 the figures have recovered their upward climb and surpassed the previous high at 69,433,565.